Paul tells the Philippian jailor, "Believe on the Lord Jesus Christ, and you will be saved." NE DAY A mob of angry people led two men down the streets of Philippi to the city prison. These men were wounded and bleeding from the severe beating they had just received in the public square. As they were being half dragged along by the leaders of the mob, every step caused them greater suffering. Finally they reached the prison, and the jailer, seeing the crowd, quickly unlocked the door and thrust the two wounded men inside. As Paul and Silas and their other companions walked through the streets on their way to the riverside to pray, a slave girl followed them one day, calling to every passer-by, "These men are servants of the Most High God, and they have come to show us the way of salvation!" And every day after that time she watched for the missionaries to pass that she might follow behind and cry out to others in this manner. This slave-girl had an evil spirit dwelling in her, which caused her to know that the missionaries were true men of God. Satan and all his evil spirits know every one who loves and worships God. They know the power of God is greater than theirs, but they try to bring trouble upon the people who served God. This slave-girl was controlled by the evil spirit, which caused her to tell people what would happen in the future. Many believed in her, and because of this they would often come to ask her questions. And always her masters would demand them to give money before she answered their questions. In this way the men who owned her for a slave became very rich. Paul felt sorry for this poor slave-girl. One day while she was following him and his companions he turned about and said to the evil spirit that was in her, "I command you in the name of Jesus Christ to come out of this girl." Immediately the evil spirit obeyed, and the girl was set free from his awful power. But no longer could she tell about future happenings; for without the evil spirit she could not do this. The masters of the slave-girl were angered when they found out that their hopes for further gain from her fortune-telling were gone. They asked what had taken place, and when they heard what Paul had done they seized him and Silas and dragged them before the rulers of the city, saying, "These men, being Jews, are causing great trouble in our city by teaching strange customs which we Romans can not receive." The people of Philippi objected to the teaching of such new religions in their city. When they heard the complaints made against Paul and Silas the rulers at once commanded that these trouble-makers should be cruelly beaten and imprisoned. And so it was that the missionaries were beaten until the blood flowed freely down their wounded bodies, and in this condition they were dragged off to prison. Before the mob departed the leaders commanded the jailer to keep the prisoners safely, and he, supposing Paul and Silas must be dangerous men, cast them into an inner room and fastened them securely by putting their feet in stocks. Here he left them alone in the dark, ill-smelling room, to suffer from their wounds. But Paul and Silas were not like other prisoners. They did not complain because they were treated so cruelly. They did not murmur because they had been wrongfully punished. As the hours passed by they talked to each other about God, and about his great love. Finally they began to pray, and far into the night their voices could be heard in the outer prison, singing songs of praise to the great God who loved them so much. The other prisoners could not sleep. They had seen these two men dragged into their prison that day. They had seen their bleeding backs and suffering faces. Now they could not understand why these prisoners would be so happy, and they listened to the songs of praise and to the prayers of Paul and Silas. At midnight suddenly the foundations of the prison began to shake in a great earthquake, and all the tightly locked doors of the prison swung open. Even the stocks which held the feet of Paul and Silas were unfastened. The jailer heard the great noise when the earthquake shook the prison, and he sprang out of bed. Seeing the doors flung open, he supposed the prisoners had all escaped. He knew the rulers would kill him if he allowed one man to escape from the prison. But Paul and Silas saw that the jailer was about to do, and Paul cried out through the darkness, "Do not harm yourself! We are all here!" Then the jailer called for a candle and rushed into the prison. There he saw all the prisoners, with Paul and Silas among them. Now the jailer was sure these men were not dangerous. He believed they were good men, who really taught the way of the true God, just as the slave-girl had cried. So he ran to them, tremblingly, and fell down at their feet crying, "Sirs, what must I do to be saved?" And there in the prison Paul talked to the jailer and the others who stood by, telling them about Jesus Christ, the Savior of all men. And he said, "If you will believe on the Lord Jesus Christ, you shall be saved." This glad news brought joy to the jailer's heart, and he believed the message of salvation. That very night he was saved, and all the others in his household also turned to God. 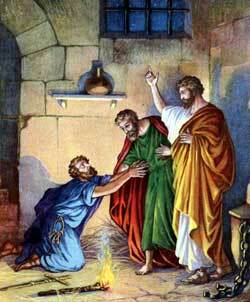 Now they took Paul and Silas into the house and washed their wounds, and bound them with clean cloths. Then they gave these two prisoners food, and entertained them as guests instead of fearing them as dangerous men. And before it was day the jailer and his household were baptized in the name of Jesus by these Christian missionaries. When the rulers heard what had happened at the prison that night they sent word for Paul and Silas to be set free. But Paul answered, "The rulers beat us publicly, although we were Romans and had not been condemned by the law; now they must come themselves to tell us that we may go free." These words frightened the rulers. They did not know that Paul and Silas were Romans, and the law forbade any ruler to punish a Roman in this manner. They came quickly to the jailer's house and begged Paul and Silas to leave the city. Before going away from Philippi, the missionaries returned to Lydia's house, to speak words of comfort to the other Christians; then they bade them good-by and went to another place. Years afterward Paul wrote a letter to the church in Philippi, and that letter we have in our Bible today, called the "Epistle of Paul to the Philippians."